Mill Creek Golf Club | Churchville Golf | Rochester | Go Golf U.S.
Mill Creek Golf Club joined Go Golf U.S. in 2016. With the deal, users can play Mill Creek for ONLY $32 compared to $49 without it! That’s a savings of $17! The deal is for 18 holes PLUS cart. Now don’t forget, users can play the course AGAIN with an extra play. The extra plays are available for $5 and have a limited number based on the course. Mill Creek has allowed 2 extra plays. The next two times users go back to play, they would save $12 per time! As seen above, this deal is valid Monday through Friday ANYTIME during the day and on the weekends/holidays AFTER 2 pm. Please be courteous of these times offered by the course as they do have the ability to charge full rate if you try to use the coupon in app during a non-allotted time by Mill Creek. Mill Creek Golf Club sits at the highest point in Monroe County. Beautiful views of the Rochester skyline and rolling hills of the Finger Lakes surround the course. 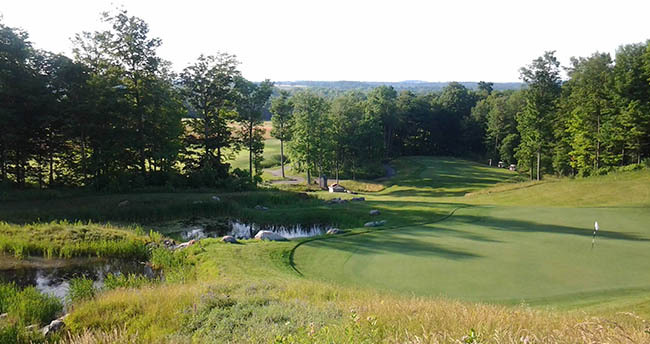 Rochester’s finest 18 Hole Championship Course integrates the spirit of the unique glacial drumlin that bisects 320 acres of forested rolling hills, windswept fescues, rock creeks and waterfalls. Creative ideas blended into unique natural beauty are hallmarks of the Renowned Golf Course Ray Hearn & Paul Albanese are the design masters of the course. Their ability to communicate their knowledge and utter willingness to understand the needs of the client resulted in a satisfying building experience. The permanent evidence: a pleasurable, memorable experience for the eventual players of the course. In addition to our 18 Hole Course & 9 Hole Short Course, Mill Creek offers one of the area’s best practice facilities and a top-notch golf academy. The Tavern Restaurant is the perfect place for great food and a relaxing atmosphere.